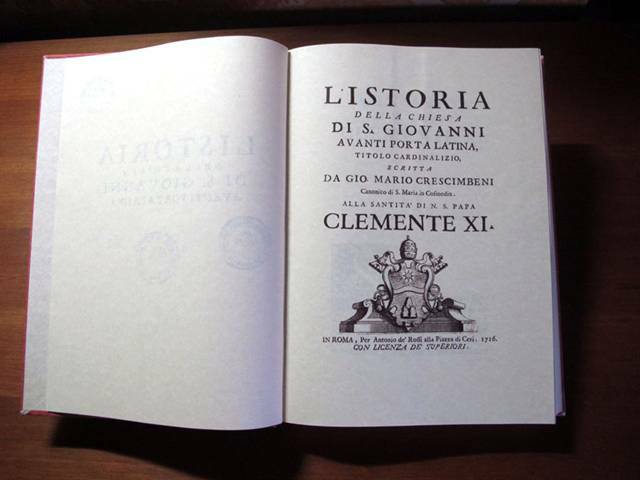 available today at the offices of the Basilica, in the restored version. 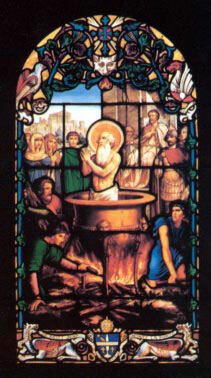 According to a collection of stories written by Tertullian at the end of the second century, St. John the Evangelist underwent martyrdom at Rome by being immersed in boiling oil, from which he emerged unharmed. He was later exiled to Patmos. The place of this martyrdom was traditionally said to have occurred at the Latin Gate (located on the southern portion of the Roman wall). This is referred to in the martyrology, which was begun in the seventh century, where already there was a celebration in honor of the martyrdom. The tradition for the building of the Basilica of St. John at the Latin Gate places its construction during the pontificate of Pope Gelasio (492-496). Further, this is confirmed by the oldest of the roof tiles, which have the imprint of a taxation stamp for the Emperor Theodoric (495-526). One of these ancient roof tiles is now used in the Basilica as a lectern. In the 8th century, the Basilica was restored by Pope Adrian I, and later the bell-tower and portico were added, and at the end of the 12th century the Basilica was reconsecrated by Pope Celestine III. 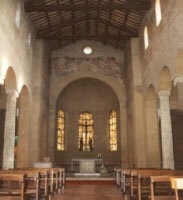 In the 16th and 17th centuries, a baroque ceiling and other baroque features were added to the interior. 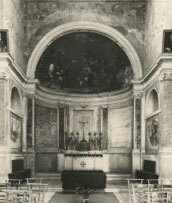 In the years 1940-1941, the baroque features were removed and the Basilica was returned to a more primitive simplicity. This last renovation was carried out by the Rosminian Fathers, who, in 1938, were given care of the Basilica and the building near-by, where they opened Collegio Missionario Antonio Rosmini which houses their International House of Studies.